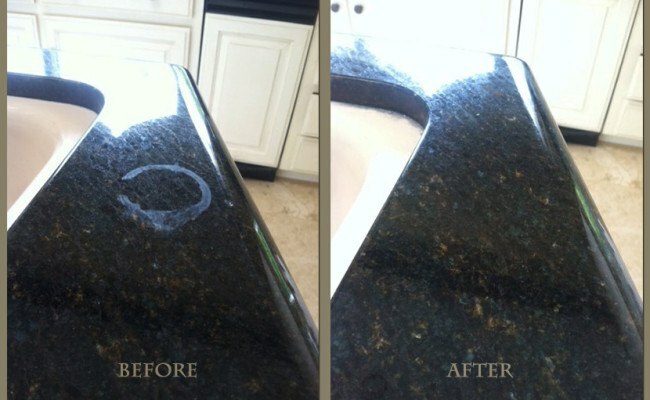 This granite vanity top in a Carlsbad home, pictured in the BEFORE image, had etching. Notice the white mark. The etching on this countertop required honing and polishing to be removed. Granite restoration should only be performed by a professional stone restoration contractor to avoid further damage of the stone. People sometimes refer to a granite etch as a water stain or a dull spot, but there’s a difference between a granite stain and an etch. We get calls like this all the time. A customer has a party, and someone leaves a drink (alcohol and/or fruit juice) on the bar. Later the customer notices a ring of white haze that does not wipe off the stone. A stain occurs when a substance penetrates the porous surface of stone, causing a color change. Sometimes stains can be removed using a poultice method. An etch, however, is caused by a chemical reaction between an acidic substance, such as an improper cleaner or fruit juice, and the stone itself. Many people believe that granite can’t etch, but certain types of granite have a higher calcium content, and calcium reacts with acidic substances. Long story short, granite isn’t impervious and sometimes needs professional attention. First, we removed the fixtures to protect them from damage and so that we could hone and polish all the way around the faucets. Our granite honing process, at a 220-400-800 grit diamond hone, followed by our granite polishing process, restored the like-new sheen of this granite countertop. Finally, we sealed the stone to protect it from future damage. As you can see in the AFTER image, the etch is completely removed and the granite vanity looks like it was just installed. The homeowner was very pleased with our work. For more information about professional granite countertop services, watch this short video or visit our Granite Services page. If you live in the San Diego area and your granite, marble, or other natural stone vanity top, countertop, or other surface has become etched, contact us online or call 619-246-0240 to discuss your options.